To celebrate my 50th birthday, I decided on two birthday month events. 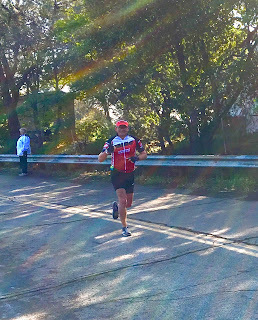 First was held just yesterday (Sunday April 9th) and was my first ever triathlon which happened to be hosted by HITS at Lake Berryessa in Napa County. The second will be my first bike Century rescheduled for later this year due to Primevera being canceled due to course closures and will report on that later in the year. I first started running regularly in 2012 and have slowly added distance and/or speed every year since then. 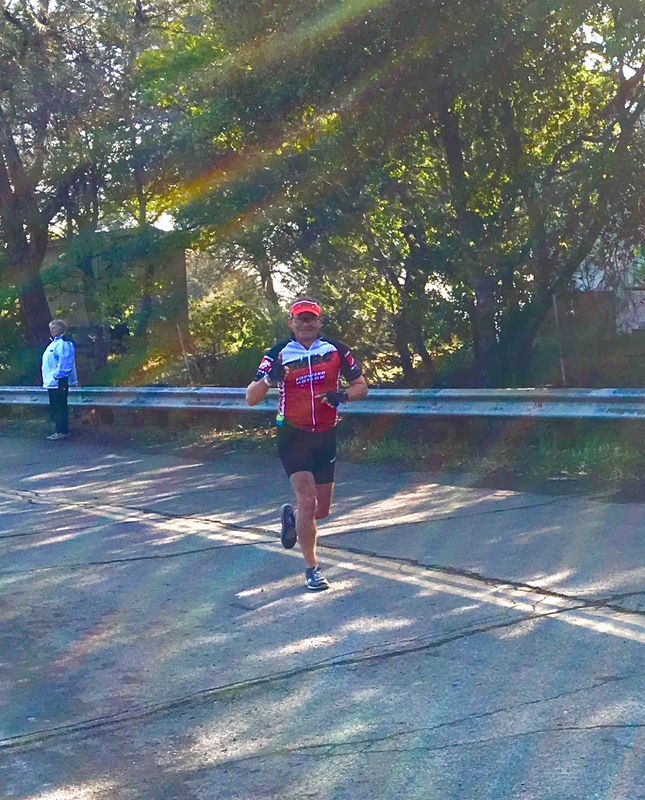 Then to cross train I added road cycling which I found I also greatly enjoyed and have participated in several Duathlons and fun rides since 2015. December last year was particularly wet which dramatically reduced my interest in outdoor cycling and trail running so I took the plunge and starting swimming at the locally (heated) outdoor public swimming pool. First swim was exhausting and lasted maybe four 25m laps. Three months later I’m still a slow plodder but can swim nonstop 800 m in ~25 min. Finally mustered enough courage to try swimming same distance in local lake with tri-suite and cap and survived. I had trouble navigating a straight line face down in water that had nearly zero visibility and would frequently pop my head up to take bearings. The suite worked very well and I never felt cold. My face on the other hand had a hard time getting used to 55 deg F cool water. Luckily I reserved hotel at El Bonita on main street St Helena weeks before because St Helena was packed the long weekend of (April 7-April 9th). We left Friday morning had breakfast at Bill’s Café, Pleasanton then very nice drive along Silverado Trail Highway to St Helena. Stopped by our favorite winery, V. Sattui for pre-arranged wine tour at 1PM and purchased a case wine and port at conclusion. Yum, that was fun. Then, off to visit Prager Port Works per recommendation from a friend and oh my that was beyond expectations and this is from someone who likes mostly beer! We bought one bottle of Port and some of their candied walnuts then off to check into hotel at 3PM. We recovered from wine tasting then off to dinner at Cindys Backstreet Kitchen. I highly recommend making reservations well in advanced for any of those highly sought after restaurants. We did pretty well but failed to make reservations at Culinary Institute which was only open Saturday and was fully booked. On Saturday morning, we ate at one of those nice restaurants for brunch called Archtype and had their well-known lemon ricotta pancakes in blueberry syrup and almond butter. We finally got into the car and made our way east for the Expo to pick up bib/chips, etc and to cheer the half and full ‘IronMen’ at the transition and finish line. We got a parking spot right near the start and should have known that was too easy (more on this later on race day). I went right to bib pickup got my packet then off to look at contents. There was a sticker sheet with stickers (front helmet, bike, swim cap and wrist). They didn’t check USAT card but did check my driver’s license. Then we went to transition area to ask if it was reserved or first come first served. She wasn’t sure but thought it was the latter (she was right). We watched the HIM (half Iron Man) finishers and full come through the T2 area and man some of these folks have ridiculously nice rigs. Alarm set for 4AM, since I always get up 3 hours before race start to have breakfast, my morning coffee and to make sure I get to the start line at least 1 hour before a race starts. Morning was uneventful and by 4:45am we were hitting the road thinking we would be early getting there by 5:30AM. LOL. Man were we wrong. When we got there more than 1.5 hours before race start the parking lot was nearly full and muddy with all the recent rains. We drove and drove and sorta came to a ‘T’ where I had a choice of going up a muddy road to a plateau or left along a road and for some unknown reason I chose right and nearly made it all the way up a road before my little Honda Civic compact car stopped dead in deep mud. Yes, I rocked back and forth trying to get out but it was no use. A couple curious campers shock their heads (luckily didn’t scream newbie) and simple said “leave it and have a nice race!”. I actually did just that. Left it in the middle of the road (but with enough clearance for a truck to come up or back down) and carried my bike and stuff to the transition area because said was closed by 6:30AM!! I had 15 min to get down the hill and to the transition area before in theory it closed. I was still in dress pants and polo shirt. I staged bike, setup my high-vis towel with bike and road stuff then proceeded to put tri-suite and cap on. Asked someone to zip me up then down to water to await instructions. Sh*t. I’m at the waters edge surrounded by hundreds of people looking out over the lake that is covered in fog with just the near ‘green' buoys showing. The yellow buoys that we are told during orientation which we are supposed to keep “on our left of counter clockwise swim” are no where to be seen! The buoy configuration is not like the diagram posted on website at all. I’m told by fellow over 40 swimmers next to me, "Don’t worry just follow the person to your left." Before we start, some swimmer raises their hand and get pulled out of the water. What? Who bails before the gun is even sounded? Under 40 male swims off. Three minutes later we are up to our knees in cold water then 5.4.3.2.1 we are off. Yikes the water is cold on the face but not bad. Ouch, who kicked me? OK, take the outside right and just get going. But, were is the buoy? No worry there are kayaks on both side so just keep between them and eventually we’ll find the elusive yellow turn buoy. Swim, swim, back strong, free style – no that doesn’t work, breast stroke – no back to back stroke, opps hit something, pop up ok green buoy half way to first yellow, keep going there I did it. Ohh, wait the women who start several minutes after us are already pawing at our heals. Damn. We are surrounded. Head down free style let’s turn and get to the buoy with the strobe light. Wow, what was that five arms that shoot up to be rescued by kayaks. Why? Just back stroke. You are in a wet suite and back stroke is super fast position to be in. Keep going almost there. Yes, there is the strobe light, turn left home stretch for the boat ramp. Mix it up and land at ~29 min just one minute short of cut off!! Out of the water and into a sea of what I assume were the Olympic distance swimmers. Got a bunch of encouraging high fives and looks like “oh man that looked rough" looks. Found my slippers then followed carpet at a jog through the swim arch to transition area. I knew my T1 was going to be long to get out of wet suite and dress in extra layers given the trouble Saturday folks had (see note). Later I read my results and spend 6 (six) minutes in T1. Eventually, I exited T1 and off for the bike portion. NOTE: It was widely reported that on Saturday, April 8th, one triathlete was hospitalized and 30 were suffering from the effects of hypothermia. See example article here. What was stated was mostly true and when we went to pick up our race bib/chips Saturday we saw the emergency vehicles and talked to some of the people who dropped that day. What wasn't accurately reported why many dropped. The straw that broke the camels back that day wasn't the cool water (~55 deg F), nor the cold ambient temperature (~37 deg F) but the cold torrential rains that befell the full and half 'IronMen' athletes when they went out on their bikes. One person I talked to said she couldn't feel her hands then arms so dropped near the end of her bike ride out of safety. She tried for an hour to warm up but couldn't. The bike portion I was ready for and I’m very comfortable on my 2008 Trek Madone 5.1. Napa I knew was rolling hills and took them one at a time dropping rider by rider as I clawed my way up from a very, very poor swim performance. One thing I didn’t think about was bringing my freak’n shoe booties and within a few minutes my feet were ice cubes. I mean no feeling in my feet whatsoever. I wore two layers on top with gloves and was fine. But, feet were useless. I did the best I could and spun, spun, spun. Back to transition was fun with a nice long descent then back to swap out helmet and shoes. It took me 2+ minutes in T2 because I spent probable a minute massaging my feet back to life. I still couldn’t feel my feet and felt like I was running on rocks for half mile then my pace increased back to normal. Average 5k pace was 9 min/mile which was very slow for 5k but not bad considering my frozen feet. Was able to drop some runners who just decided to walk/jog the 5k. There was one aid station at 5k turnaround with water, watered down electrolyte and GU packets. The sprint down the hill to the finish line was euphoric because crowd was ecstatic even for us beginner sprint participants. Crossed the finish line with smile on my face in full sprint. Received my medal, got some recovery food (fruit, bagel, mini snikers bar) and hung near finish to chit-chat and cheer other finishers. Walk back with food to wife, used restroom then jumped into tow truck to unstuck the very stuck Honda Civic. While I started the race my wonderful wife started talking to HITS volunteers about getting our Honda pulled out of the mud. One gentleman said he could use his jeep to do it but wouldn't be able to do it for a few hours. Unfortunately for us we needed to be back to the motel to check out so wife smartly choose to call local tow company that came out in under an hour. It was expensive but guy (and his dog) were very friendly and he and his tow winch made short work of pulling us down the hill to pavement. Took all but a few minutes. I predicted many, many more cars would need to be pulled out today. And tow truck driver said it was worse the day before! Yes, got up the hill. Yes, stuck good! After our poor, mud covered civic was rescued we drove quickly back to St Helena with only 60 min left for 11:30AM check out from hotel. Parked, ran to hotel to shower, dress in clean clothes toss all our stuff into the car, then to office to checkout by 11:15. Whew, did it! We drove around St Helena on Main street and some how my wife found one of those coin operated self-service power wash places and we power washed the poor civic… twice. After two $3 power washes the car actually looked normal. I know I shouldn’t tell you this but I hit the Trek road bike twice with the power wand to get most of the dirt off. Then, we went back to V. Sattui since we are members now to the member-only reserve club for free tasting in the cellar, bought bottle of wife’s favorite Moscatto Frizzante) some French Brie and sat in the garden area and just soaked up the sun for a couple hours before our scheduled 1:30PM lunch at Farmstead. Well, I wanted an adventure for my 50’th birthday on this planet and boy did I get one. We ate well, drank well and I just barely made it though my first Triathlon. I could not have made it without support from my wife and many, many runner, cylist and swim friends I’ve met and trained with over the years. I already signed up for HITS Napa 2018 and have a long list of things to improve upon! SWIM 750m 28:54 SLOW Just made cutoff of 30min! T1 06:02 I knew T1 was going to be long getting out of wet, tri-suite, putting on socks and double up on upper layers but 6 min was excessive. Definitely gotta train more on T1. BIKE 12.5 miles 53:27 14 miles/hour Bike performance was acceptable. Next time I need to bring full booties to keep my feet warm. T2 02:25 Acceptable T2 given 1 min to warm up feet after ride. RUN 5k 28:24 9 min/mile Acceptable 5k pace again given issues with cold feet.